In a rush at a school zone? Seriously? Back to school—it’s a hectic time for kids and for parents. There’s a lot of rushing around, dropping kids off, picking kids up, trying to get to class, and work, and home again on time, in all sorts of weather, all within a short 15 or 20 minutes window in the morning and the afternoon. This needs to change. 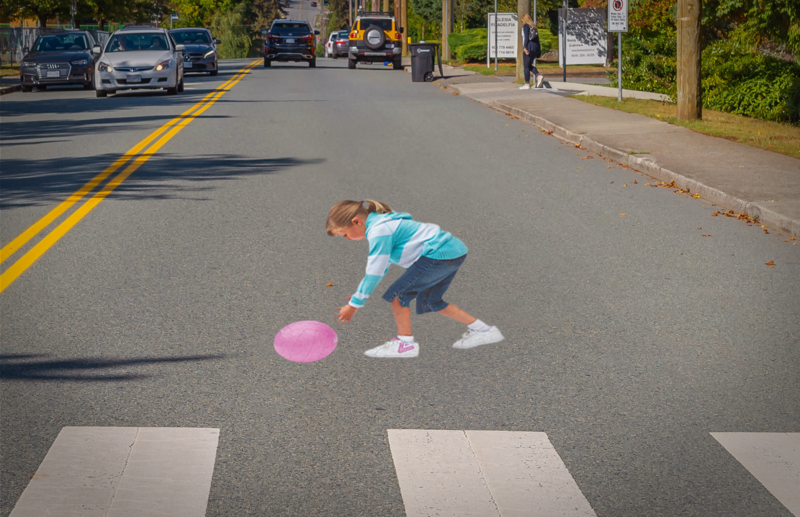 So we partnered with our good friends at BCAA to bring back one of the most thought-provoking, attention-grabbing projects in our history: Pavement Patty, a 3D illusion of a child chasing a ball into the street. Printed in weatherproof, skid-proof vinyl and installed on the pavement directly in front of elementary schools, the installation “comes to life” as drivers approach it, grabbing their attention in a way that a straightforward “Slow Down” sign simply can’t. The installation isn’t jarring—most drivers approach it slowly to reach the optimal viewing point. But it’s certainly memorable. And that’s our point. We want to get you thinking about school zone safety: about how many distractions there are. About how unpredictable kids can be. About how pressed for time we always seem to be. More than anything, about how rushing around can have serious consequences. We get it: drop-offs and pick-ups are tough. A lot of times, parents are in a hurry, or are running late for work. And let’s face it: we’re often distracted by our phones and our passengers too. But too many kids are getting hurt. We need to change our attitudes, and be extra vigilant, extra patient, and extra aware of the dangers, so we can make going to school a lot safer. How? By following our common sense. Sure, it’s easy to brush off or dismiss injury concerns by convincing ourselves that bad things only happen to “other people.” But deep down, we know that’s not true. They can—and do—happen to us. So give yourself a little more time in the morning, so you don’t have to feel rushed—getting out of the house even five minutes earlier can make all the difference. Teach the kids to exit the car carefully, and walk slowly and attentively rather than running in front of cars. Be patient with other Moms and Dads. And please—slow down when you’re in a school zone. We know this is not “new” advice. As drivers, we already know this stuff. But let’s face it: we need a reminder every now and again. With so much going on—and so much riding on it—it’s up to all of us to keep our kids safe. If you find yourself near Brentwood Park Elementary school in Burnaby, or outside the front lawn of Rutland Elementary in Kelowna, take a drive past our installation. Tell your friends about it. Post it on social media. And let everyone know to drive safe in school zones. Our kids are depending on it.